*Katharina Frei* - Kreatives Sammelsurium: Whiff of Joy Preview 2 - Happy New Home! Whiff of Joy Preview 2 - Happy New Home! Today I want to showcast another new stamp of the upcoming Whiff of Joy release ( February 14th). It is Charlotte's castle, designed by the very talented Alison Acton. Heute möchte ich euch einen weiteren Stempel der bevorstehenden Neuerscheinungen von Whiff of Joy Stamps (14. Feburar) zeigen. Es handelt sich um Charlotte's Schloss, das von der sehr talentierten Alison Acton designed wurde. 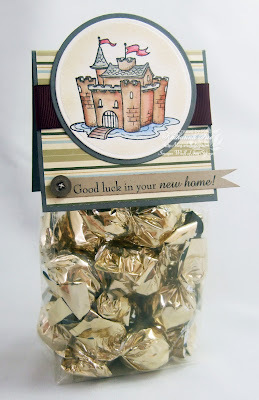 I did the background of the castle with my Stampin' Up pastels ( So Saffron) and a sponge dauber. I used the round Nestability to cover the border. The sentiment is generated on the computer. I'll show you another preview tomorrow! Ich habe den Hintegrund des Schlosses mit Stampin' Up pastels ( So Saffron) und einem Sponge Dauber gemacht. Dabei habe ich das runde Nestabilities die als Schutz für den Rand benutzt. Der Text ist am Computer erstellt und heißt "Alles gute im neuen Heim!". Morgen gibt es die nächste Vorschau hier bei mir. Crafting Tip: Adhere your bagtopper with double-sided adhesive tape to your bags, which you don't see from the outside. Basteltipp: Befestigt euren Bagtopper mit doppelseitigem Klebeband and euren Säckchen, das man von Aussen ja nicht sieht. Paper: Stampin' Up grey cardstock, dp "Le Jardin"
Gorgeous! Love the stamp Katharina and the bagtopper is just fabulous. I have been checking the blogs of your DT members since yesterday and I've seen some gorgeous stamps and creations, you've got a very talented Design Team Katharina! This is such a brilliant idea that castle looks fabulous! This is a beautiful stamp, perfect for a new home card or gift. I'm looking forward to seeing the next preview. Another fabulous image, I can see you're really spoiling us now. The chocolates look good too. Can't wait to see more. 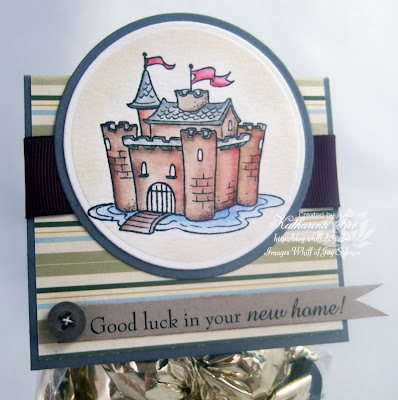 wow ... wonderful castle and a great bag topper! Love your sneek peaks! Oh - das ist ja ein richtiges Traumschloß! Love your topper! I have been checking out the design team blog - this release is awesome! oh my goodness i love love love these stamps!!! I can't wait! What a fabulous idea Katharina, love it! Oh, I so love these two! Can't wait to see the rest of the collection. There's just precious! Love the idea of the topper! Beautiful Katharina and what a good idea for a present. This is lovely, looking forward to seeing the new releases. Fabulous topper Katharina!! Gorgeous castle!! Love it!!!!! Can hardly wait for the rest. Love that idea, those stamps are calling to me. these new stamps look very interesting! I must say, that you are very good with very different desings at Whiff of Joy! Wonderful! Superbe, j'aime beaucoup les petits sachets. This is a stamp useful on layouts I think.. It look great! !